Breathing exercises or “PRANAYAM’, the word is derived from ‘Prana‘ which stands for ‘life force’ and ‘Ayama‘ which means ‘to lengthen or to work on it’. Prana, in yogic terms, means the force within the body that is vital for the functioning of the body as well as its vitality. Breath is our vital source of energy. Did you know that we can throw out 80 per cent of the toxins from our body by breathing correctly? The key to healthy and happy living lies in right breathing. When we attend to our breath, it can heal us from within. Our cells regenerate all the time, and cannot regenerate without oxygen. Breathing is the fastest and most efficient way for our bodies to get oxygen. Deep breathing helps our immune system regenerate cells in order to fight infection and any other ailments that affect us. Certain breathing exercises have been shown to greatly increase the efficiency of our immune system. The better the air quality and the deeper you breathe the more you can help your immune system work properly. Routinely practising deep breathing exercises can improve your overall immune system. Pranayama enhances and stimulates the immune system. Improves function and strengthens cells, tissue, glands and organs. Pranayama releases stress, anxiety and depression. Boosts overall health and cures many health issues. Cure asthma, headache, Migraine, neurological problems, depression, gastric problems. This is a great yoga sequence that helps to improve circulation and clear congestion in the bronchial region and sinuses. It stimulates digestion and, through muscular contraction and extension, pumps blood and lymphatic fluid through the thoracic muscle groups. It increases cardiovascular fitness and helps stimulate the kidneys while relieving stress from the neck and shoulder area, and extending the lumbar spine region. Rest your arms and knees on the floor. On the inhale breath, lift and expand the front chest up and forward, elongate your throat, draw your shoulders back, and curve your middle spine downwards as you tuck in your tailbone. On a strong exhale, tuck your chin to your throat, pull in your belly, and arch your spine upwards (like an angry cat), rolling your shoulders forward and down to compress the front chest. Inhale to Cow Pose and exhale to Cat Pose with a fluid up-and-down, wave-like motion of the spine and torso. Repeat the cycle 5 times. Kapal meaning skull, Bhati meaning shining and pranayama meaning breathing technique. It is a great breathing exercise and can improve bodily functions. This breathing exercise can remove 80% of the toxins in our body through the outgoing breath. Regular practice of Kapal Bhati Pranayama can help detoxify all the systems in our bod How to do Kapal Bhati Pranayama. Improves blood circulation and nervous system functioning. Sit at a comfortable place with your spine straight. Place your hands on the knees with palms open to the sky. Take a deep breath in. As you exhale, pull your stomach in. 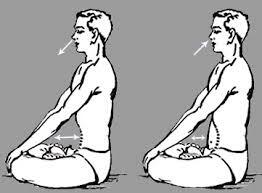 Pull your navel in back towards the spine. Do as much as you comfortably can. You may keep your right hand on the stomach to feel the abdominal muscles contract. Take 15-20 such breaths to complete one round of Kapal Bhati Pranayama. Do two more rounds of Kapal Bhati Pranayam. Place your index fingers on the cartilage between your cheek and ear. Breathe in again and continue the same pattern 4-5 times. Dog Breathing cleanses and detoxifies the body while expelling the toxins out from deep inside your tissues. The sharp contracting movements while practising Dog Breathing strengthens the abdominal muscles. Helps in improving the respiratory capacity and prevents the person from catching any respiratory disorder if practised regularly. Sit in Easy Pose with your chin in and your chest out. Stick your tongue all the way out and keep it out as you rapidly breathe in and out through your mouth. This is called Dog Breath. Continue this breath for 3-5 minutes. To finish, inhale, and hold your breath for 15 seconds and press the tongue against the upper palate. Exhale. Repeat this sequence two more times. Beginners can start with 15- 20 seconds and gradually reach up to 1 and then up to 5 minutes. It strengthens the immune power. 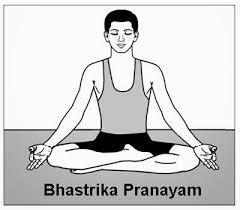 Practice bhastrika pranayama for 10 minutes in the morning and evening on an empty stomach daily for one month. Sit comfortably on the flat ground. Take a deep breath through both nostrils and fill the lungs with air and then exhale with a hissing sound. Those suffering from lungs, heart problems and high blood pressure should practice slowly. High blood pressure patients should exhale through the mouth instead of the nose. Our immune system does a remarkable job of defending us against disease-causing microorganisms. But sometimes it fails: A germ invades successfully and makes you sick. Is it possible to intervene in this process and boost your immune system? Can some exercises help in improving our overall immunity? Yes! Certain yoga asanas can definitely help in improving our immunity if done on a regular basis! How does yoga boost immunity? 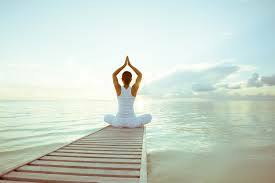 Yoga helps in stimulating the physiological systems directly linked to the immune system, i.e. the digestive, circulatory, endocrine and nervous systems. It also helps in detoxifying and oxygenating the body and increases the circulation of lymphatic fluid. This fluid moves through the body, collecting bacteria and viruses, and filtering them through the lymph nodes. Yoga helps in stimulating and balancing the body’s biochemistry through the thymus gland, and thyroid glands. It largely helps in reducing stress and fatigue, two factors that compromise the immune system. Also, it assists digestion, which improves the utilisation of nutrients and the release of toxins. Method to do it: Arrange your body on the floor in a way that your legs are up on them. Next, move your hips as close to the wall as possible, then start walking your feet up the wall until your body is in a somewhat L-shaped position. Make any adjustments to facilitate a more relaxing space– maybe place a pillow under your head, or let your arms rest on your belly or out to the sides. At this point, focus on your breath– try elongating your breath, taking a deep, slow inhale through your nose and a deep, slow exhale through your nose. Try to stay in the pose for at least 5 minutes for optimal benefits. If your hamstrings are tight, bend your knees and bring your seat away from the wall to allow your body to relax into this pose. How to do it: To get into this position, come onto the ground on your stomach. Place both palms under the shoulders. Draw your elbows towards your side body. Keeping the gaze down towards your mat, maintain a neutral neck. As you inhale, push down through the palms and lift the chest, engaging the core and lifting the quads off the ground. Tops of the feet should still press into the ground. The neck remains neutral and the gaze stays on the ground. Cobra Pose will leave you feeling revitalized and will also provide a boost of energy after a long day of sitting in the same position. Precautions: Common postural errors during this asana include overarching the neck and lower back. One recommendation is to keep the gaze directed down at the floor and focus on bringing movement into the area between the shoulder blades (the thoracic area, or middle back). This is a restorative pose, which helps open up the heart and lungs, breaking up congestion in the lungs and sinuses. When we sit hunched over our desks all day, our breath becomes shallow and stagnant. This is one of the best poses to access a deep diaphragmatic breath and helps balance an agitated nervous system. 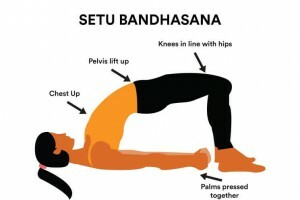 This asana stretches the shoulders, legs, spine and whole body; builds strength throughout the body, particularly the arms, legs, and feet; relieves fatigue and rejuvenates the body. It improves the immune system, digestion and blood flow to the sinuses. It also allows congested sinuses to drain. How to do it: Stand on four limbs, such that your body forms a table-like structure. Exhale and gently lift your hips and straighten your elbows and knees. You need to ensure your body forms an inverted ‘V’.Your hands should be in line with your shoulders, and your feet in line with your hips. Make sure that your toes point outwards. Now, press your hands into the ground and lengthen your neck. Your ears should touch your inner arms, and you should turn your gaze to your navel. Hold for a few seconds, and then, bend your knees and return to the table position. This is a deep, but gentle backward bend. It opens and expands the chest area, releases tension in the back, hips and shoulders. How to do it: Slowly lower the feet, keeping knees bent and feet hip-distance apart. Slowly uncurl the spine onto the floor and, when the head reaches the ground, relax completely as you exhale. On an inhale, press into your feet and raise the hips and lower back off the mat. Interlace fingers underneath you. Shift from side to side to get comfortable, and breathe deeply. A recent study found that practising yoga can alter gene expression that boosts immunity at a cellular level! With monsoons restricting outdoor activities and workouts, what better than improving immunity and staying fit as well with these yoga poses which can be easily done in the comfort of your home! 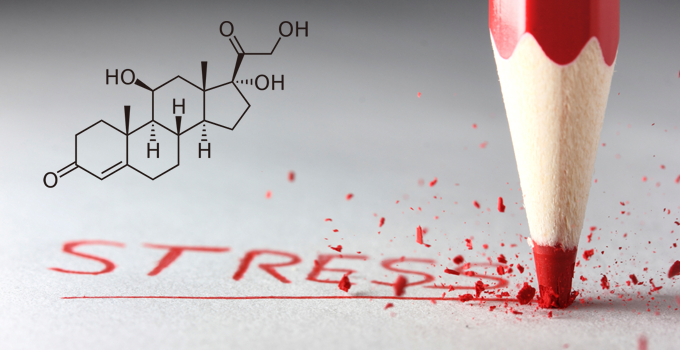 The cortisol stress hormone management system is released by the adrenal cortex glands in order to regulate our blood sugar, blood pressure and immune system. And while it does regulate blood sugar, blood pressure and immune system, its release at a wrong time are very harmful. What triggers the rise of this crucial hormone is mental, physical stress, too much insulin spikes, too many stimulants, overindulgence of processed foods and toxicity build up. Burning stubborn belly fat has to be one of the most popular stresses that people have and most have a problem dealing with this issue. What we fail to identify is that losing body fat especially on the lower abdomen this is a hormonal issue. Dealing with Cortisol can become get tricky, but, if dealt with proper techniques and supplements one can get the Cortisol levels under control. 2) Removing sugar and processed foods from the regular diet and replacing them with whole organic foods will help improve digestion and in turn a healthier GUT. 3) Less toxicity and acidity which adds stress to the body internally, by making the simple shifts in the food choices, thoughts and emotions. 4) To take control of Cortisol levels one needs to learn to unwind and relax every single day for at least 20 – 30 minutes and learn to take deep breaths and clear the mind. 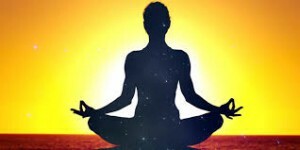 5) Meditation and yoga are some of the excellent ways to relax and bring down cortisol effectively. 6)Exercise is also a saviour, and has been shown to reduce cortisol effectively, BUT if overdone and done incorrectly it could have the opposite effect. 7) Cortisol is at its lowest during sleep. Green banana flour is slowly but steadily joining the superfoods wagon in India due to its numerous health benefits. It is made by drying unripe green bananas and grinding them to a fine powder. It has a mild nutty taste and is very similar to wheat flour, thus making it an ideal replacement in gluten-free recipes. Since it has a high starch content it allows you to use less flour than required in your everyday recipes. So whenever it is used as an alternative to wheat flour, the quantity of banana flour to be used should be 30% less than the quantity of wheat flour mentioned in the recipe. One of the primary reasons for the numerous benefits of green banana is the presence of resistant starch in it. Most starches are broken down by enzymes in our small intestine into sugar, which is then absorbed into the blood. However resistant starch is a type of starch that isn’t fully broken down. Instead, it gets fermented in the large intestine and produces short-chain fatty acids (SCFA). SCFA are known to provide a host of benefits such as inhibiting the growth of pathogenic bacteria, promoting colon health, increasing nutrient circulation etc. Resistant starch is only present in raw green banana. The ripe yellow ones have undergone the natural process of hydrolysis wherein their starch has gotten converted into sugar thus making them sweet to taste. Heart health: It is an excellent source of potassium which helps to control the electrical activity of the heart. It also helps lower cholesterol and aids nerve and muscle activity. Diabetic friendly: Since the young bananas are picked before they ripen, their sugar content never fully develops. Hence they are lower in natural sugars. Ideal for weight watchers: The resistant starch in green bananas slows the release of food through the gut. This slows the insulin response and prevents that sugar spike and consequent sugar crash. Thus, ensuring that we feel fuller for a longer period of time and avoid binging on unhealthy snacks in between meals. Aids in digestion: The high content of prebiotic fibre in banana flour helps to support the good bacteria present in the gut, bowel, and colon. This, in turn, promotes a healthy digestion and bowel movement. 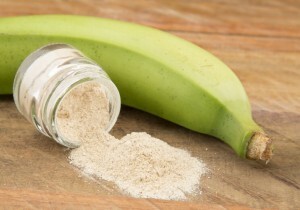 Inhibits the growth of pathogenic bacteria: RS II, (Resistant Starch subtype II) present in green banana flour, breaks down into short chain fatty acids & raises the pH level of the large intestine which creates adverse conditions for pathogenic bacteria while favouring the growth of beneficial bacteria. Increases absorption of minerals– especially calcium which can aid in preventing Osteoporosis. Gluten Free: Ideal for those suffering from gluten intolerance especially since it behaves very similar to wheat flour and serves as an ideal replacement in wheat containing recipes.